The Zionist Congress was established in 1897 by Theodor Herzl as the supreme organ of the Zionist Organization (ZO) and its legislative authority. In 1960 the names were changed to World Zionist Congress (Hebrew: הקונגרס הציוני העולמי‎ HaKongres HaTsioni HaOlami) and World Zionist Organization (WZO), respectively. The World Zionist Organization elects the officers and decides on the policies of the WZO and the Jewish Agency. The first Zionist Congress was held in Basel, Switzerland in 1897. Any Jew over age 18 who belongs to a Zionist association is eligible to vote, and the number of elected delegates to the Congress is 500. 38% of the delegates are allocated to Israel, 29% to the United States of America, and 33% to the remainder of the countries of the Diaspora. In addition there are about 100 delegates which are appointed by International Organizations (e.g. B'nai B'rith, see below) affiliated with WZO. After the First Zionist Congress in 1897, the Zionist Congress met every year until 1901, then every second year from 1903 to 1913 and 1921 to 1939. Until 1946, the Congress was held every two years in various European cities, save for interruptions during the two World Wars. Their goal was to build an infrastructure to further the cause of Jewish settlement in Palestine. Since the Second World War, meetings have been held approximately every four years. Also, since the creation of the State of Israel, the Congress has met every four or five years in Jerusalem. At the 34th World Zionist Congress in 2002, the Green Zionist Alliance became the first environmental organization to ever hold a seat at the World Zionist Congress. The 36th Congress was held in June 2010 in Jerusalem and Avraham Duvdevani from the modern-Orthodox “Mizrahi” camp was elected as Chair. Natan Sharansky was elected as head of the Jewish Agency for Israel which was separated again from the position of WZO Chair. The upcoming 38th World Zionist Congress will take place in 2020. The World Zionist Congress includes representatives of Zionist World Unions, Women's Zionist Organizations with Special Status and International Jewish Organizations. Zionist participants in the World Zionist Congress are free to form Brit Olamit or Zionist World Unions (ideological groupings), which are somewhat like political parties. While Israeli political parties can participate in the Congress, brits are also organized and voted into the Congress by non-Israelis, making the Congress a multinational deliberative body for the Jewish diaspora. However, as aliyah has brought Jews to Israel from other countries, Israeli representation in the legislature has increased at the expense of non-Israeli Jewish diaspora representation. A Brit Olamit (World Union) must have representation in at least five countries to send a delegation to the Congress. WIZO – is an international, non-party Zionist body, which receives global representation by virtue of an agreement entered into in 1964. The international Jewish organizations have also been represented in the Zionist Congress since 1972, provided that they accept the Jerusalem Program, even if not all their members are declared Zionists. These bodies have limited voting rights – they do not vote on matters of candidature and elections to the institutions of the WZO. In addition to the delegates with full voting rights participating in Congress, there are also participants in an advisory capacity which can participate in debates but have no voting rights. These may consist of office holders such as members of the Zionist Executive, members of the Zionist General Council who were not elected as delegates to Congress, Chairs of the Zionist Federations, judicial office holders - the President of the Zionist Supreme Court, the Attorney, the Comptroller and representatives of the Aliyah Movement. Observers with no speaking or voting rights can be invited by the Zionist Executive or the Congress Presidium. Opening of the Congress, including a speech by the Chairman of the Executive, and other speeches determined in the agenda, election of the Congress Presidium, the report of the President of the Zionist Supreme Court on the election results, reports of the members of the Zionist Executive in supplement to the printed report, election of the Congress committees. Election of the new Executive, according to the proposal of the Congress Standing Committee. Reports of the committees and voting on the draft resolutions presented by them. The report of the Standing Committee and voting on its proposals for members of the Zionist General Council, the Comptroller and the Legal Institutions. Some of the older and larger American Zionist groups, such as Hadassah and Emunah, do not run and are automatically assigned seats. 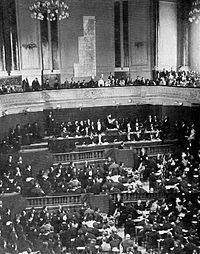 The Zionist Congress, later to become the World Zionist Congress, was held at intervals of 1 year (1897-1901), then 2 years (1903-1939) until the outbreak of the Second World War, with an eight-year break (1913-1921) due to the First World War. "Zionism seeks for the Jewish people a publicly recognized legally secured homeland in Palestine." "Were I to sum up the Basel Congress in a word - which I shall guard against pronouncing publicly - it would be this: At Basel I founded the Jewish State." The Twenty-third Zionist Congress, held in 1951 in Jerusalem, Israel, was the first to be held after the establishment of the State of Israel, and the first held in Jerusalem, which would become the norm. It was opened at the graveside of Theodor Herzl, whose remains had been moved from Vienna and reburied on the top of a hill in Jerusalem that was renamed after him, Mount Herzl. The Congress issued the "Jerusalem Program", placing its main focus on the newly created state as the central unifying element for the Jewish people. Ruth Popkin was the first woman to be Chair of the Presidium and President of the World Zionist Congress, being elected to both positions in 1987. ^ a b c d e f g "Zionist Congress". World Zionist Organization. Retrieved 21 Feb 2015. ^ a b "Zionism: World Zionist Organization (WZO)". American-Israeli Cooperative Enterprise. Retrieved 11 December 2017. ^ "Rules for the Election of Delegates to the Zionist Congress" (Microsoft Word doc). World Zionist Organization. June 2004 . Retrieved 16 January 2014. ^ "The Zionist Century | Concepts | Zionist Congresses". Jafi.org.il. Archived from the original on August 21, 2008. Retrieved 2008-11-29. ^ a b "Zionisten-Kongress in Basel - am 30. und 31. August 1897. Offizielles Protokoll" [Proceedings of the 1st Zionist Congress August 30 and 31, 1897 in Basel]. sammlungen.ub.uni-frankfurt.de (in German). Wien: Verlag des Vereins Erez Israel. 1898. ZDB 2176334-3. Retrieved 23 June 2017. ^ a b "Stenographisches Protokoll der Verhandlungen des 2. Zionisten-Congresses gehalten in Basel vom 28. bis 31. August 1898" [Proceedings of the 2nd Zionist Congress August 28 to 31, 1898 in Basel]. sammlungen.ub.uni-frankfurt.de (in German). Wien: Verlag des Vereines "Erez Israel". 1898. ZDB 2176334-3. Retrieved 23 June 2017. ^ a b c d e f g h i j k l "Zionist Congress: First to Twelfth Zionist Congress (1897 - 1921)". Jewish Virtual Library. Retrieved 20 March 2015. ^ a b c d e f g h i j k l m n o p q r s t u v w Mitchell Geoffrey Bard, Moshe Schwartz (2005). 1001 Facts Everyone Should Know about Israel. Jason Aronson, Inc. pp. 5–8. ISBN 978-0-7425-4358-4. Retrieved 20 March 2015. ^ a b "Stenographisches Protokoll der Verhandlungen des 3. Zionisten-Congresses Basel 15. bis 17. August 1899" [Proceedings of the 3rd Zionist Congress August 15 to 17, 1899 in Basel]. sammlungen.ub.uni-frankfurt.de (in German). Wien: Verlag des Vereins Erez Israel. 1899. ZDB 2176334-3. Retrieved 23 June 2017. ^ a b "Stenographisches Protokoll der Verhandlungen des 4. Zionisten-Congresses in London 13., 14., 15., und 16. August 1900" [Proceedings of the 4th Zionist Congress August 13 to 16, 1900 in London]. sammlungen.ub.uni-frankfurt.de (in German). Wien: Verlag des Vereins Erez Israel. 1900. ZDB 2176334-3. Retrieved 23 June 2017. ^ a b "Stenographisches Protokoll der Verhandlungen des 5. Zionisten-Congresses in Basel 26., 27. 28., 29. und 30. Dezember 1901" [Proceedings of the 5th Zionist Congress December 26 to 30, 1901 in Basel]. sammlungen.ub.uni-frankfurt.de (in German). Wien: Verlag des Vereins Erez Israel. 1901. ZDB 2176334-3. Retrieved 23 June 2017. ^ a b "Stenographisches Protokoll der Verhandlungen des 6. Zionisten-Congresses Basel August 1903" [Proceedings of the 6th Zionist Congress August 1903 in Basel]. sammlungen.ub.uni-frankfurt.de (in German). Wien: Verlag des Vereins Erez Israel. 1903. ZDB 2176334-3. Retrieved 23 June 2017. ^ a b "Stenographisches Protokoll der Verhandlungen des 7. Zionisten-Congresses Basel und des außerordentlichen Kongresses in Basel 27., 28., 29., 30., 31. Juli, 1. und 2. August 1905" [Proceedings of the 7th Zionist Congress and special congress July 27 to August 2nd, 1905 in Basel]. sammlungen.ub.uni-frankfurt.de (in German). Berlin: Jüdischer Verlag. 1906. ZDB 2176334-3. Retrieved 23 June 2017. ^ a b "Stenographisches Protokoll der Verhandlungen des 8. Zionisten-Kongresses im Haag vom 14. bis inklusive 21. August 1907" [Proceedings of the 8th Zionist Congress August 14 to 21, 1907 in The Haague]. sammlungen.ub.uni-frankfurt.de (in German). Köln: Jüdischer Verlag. 1907. ZDB 2176334-3. Retrieved 23 June 2017. ^ a b "Stenographisches Protokoll der Verhandlungen des 9. Zionisten-Kongresses in Hamburg vom 26. bis inklusive 30. Dezember 1909" [Proceedings of the 9th Zionist Congress December 26 to 30, 1909 in Hamburg]. sammlungen.ub.uni-frankfurt.de (in German). Köln und Leipzig: Jüdischer Verlag. 1910. ZDB 2176334-3. Retrieved 23 June 2017. ^ a b c "Stenographisches Protokoll der Verhandlungen des 10. Zionisten-Kongresses in Basel vom 9. bis inklusive 15. August 1911" [Proceedings of the 10th Zionist Congress August 9 to 15, 1911 in Basel]. sammlungen.ub.uni-frankfurt.de (in German). Berlin und Leipzig: Jüdischer Verlag. 1911. ZDB 2176334-3. Retrieved 23 June 2017. ^ a b "Stenographisches Protokoll der Verhandlungen des 12. Zionisten-Kongresses in Karlsbad vom 1. bis 14. September 1921" [Proceedings of the 12th Zionist Congress September 1 to 14, 1921 in Karlsbad (Karlovy Vary)]. sammlungen.ub.uni-frankfurt.de (in German). Berlin: Jüdischer Verlag. 1922. ZDB 2176334-3. Retrieved 23 June 2017. ^ a b "Stenographisches Protokoll der Verhandlungen des 13. Zionisten-Kongresses vom 6. bis 18. August 1923 in Karlsbad" [Proceedings of the 13th Zionist Congress August 6 to 18, 1923 in Karlsbad (Karlovy Vary)]. sammlungen.ub.uni-frankfurt.de (in German). London: Zentralbüro der Zionistischen Organisation. 1924. ZDB 2176334-3. Retrieved 23 June 2017. ^ a b "Protokoll der Verhandlungen des 14. Zionisten-Kongresses vom 16. bis 31. August 1925 in Wien" [Proceedings of the 14th Zionist Congress August 16 to 31, 1925 in Vienna]. sammlungen.ub.uni-frankfurt.de (in German). London: Zentralbüro der Zionistischen Organisation. 1926. ZDB 2176334-3. Retrieved 23 June 2017. ^ a b "Protokoll der Verhandlungen des 15. Zionisten-Kongresses Basel 30. August bis 11. September 1927" [Proceedings of the 15th Zionist Congress August 30 to September 11, 1927 in Basel]. sammlungen.ub.uni-frankfurt.de (in German). London: Zentralbüro der Zionistischen Organisation. 1927. ZDB 2176334-3. Retrieved 23 June 2017. ^ a b "Protokoll der Verhandlungen des 16. Zionistenkongresses und der konstituierenden Tagung des Council der Jewish Agency für Palästina, Zürich, 28. Juli bis 14. August 1929" [Proceedings of the 16th Zionist Congress and constituent meeting of the Council of the Jewish Angency for Palestine, July 28 to August 14, 1929 in Zürich]. sammlungen.ub.uni-frankfurt.de (in German). London: Zentralbüro der Zionistischen Organisation. 1929. ZDB 2176334-3. Retrieved 23 June 2017. ^ a b "Protokoll der Verhandlungen des 17. Zionistenkongresses und der zweiten Tagung des Council der Jewish Agency für Palästina, Basel, 30. Juni bis 17. Juli 1931" [Proceedings of the 17th Zionist Congress and 2nd meeting of the Council of the Jewish Angency for Palestine, June 30 to July 17, 1931 in Basel]. sammlungen.ub.uni-frankfurt.de (in German). London: Zentralbureau der zionistischen Organisation. 1931. ZDB 2176334-3. Retrieved 23 June 2017. ^ a b "Protokoll der Verhandlungen des 18. Zionistenkongresses und der dritten Tagung des Council der Jewish Agency für Palästina, Prag, 21. August bis 4. September 1933" [Proceedings of the 18th Zionist Congress and third meeting of the Council of the Jewish Angency for Palestine, August 21 to September 4, 1933 in Prague]. sammlungen.ub.uni-frankfurt.de (in German). Wien: Fiba-Verlag. 1934. ZDB 2176334-3. Retrieved 23 June 2017. ^ a b "Protokoll der Verhandlungen des 19. Zionistenkongresses und der vierten Tagung des Council der Jewish Agency für Palästina, Luzern, 20. August bis 6. September 1935" [Proceedings of the 19th Zionist Congress and fourth meeting of the Council of the Jewish Angency for Palestine, August 20 to September 6, 1935 in Lucerne (Switzerland)]. sammlungen.ub.uni-frankfurt.de (in German). Wien: Fiba-Verlag. 1936. ZDB 2176334-3. Retrieved 23 June 2017. ^ a b Zaslawski, Valerie (2017-01-03). "Zionistenkongress von 1946: Den Judenstaat endlich vor Augen" [Zionist Congress of 1946: The Jewish state]. Neue Zürcher Zeitung (in German). Retrieved 24 June 2017. ^ Tigay, Alan (2015-01-05). "Ruth Popkin, Hadassah past national president, dies at 101 | Obituaries". Jewish Journal. Retrieved 2015-04-14. ^ "Stenographisches Protokoll der Verhandlungen des 11. Zionisten-Kongresses in Wien vom 2. bis inklusive 9. September 1913" [Proceedings of the 11th Zionist Congress September 2 to 9, 1913 in Vienna]. sammlungen.ub.uni-frankfurt.de (in German). Berlin und Leipzig: Jüdischer Verlag. 1914. ZDB 2176334-3. Retrieved 23 June 2017. This page was last edited on 4 March 2019, at 06:43 (UTC).